Before there was CSI and NCIS, there was a mild-mannered forensic scientist whose diligence would help solve the 20th century's greatest crime. 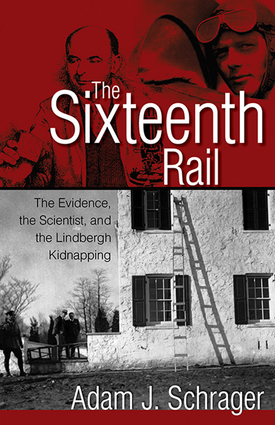 Arthur Koehler was called the "Sherlock Holmes of his era" for his work tracing the ladder used to kidnap Charles Lindbergh's son to Bruno Hauptmann's attic and garage. A gripping tale of science and true crime. Adam Schrager is an Investigative producer and reporter with WISC-TV, the CBS affiliate in Madison, Wisconsin. He has covered politics for more than 20 years, most recently at Wisconsin Public Television and at KUSA-TV in Denver. Previously, he worked at commercial television stations in La Crosse, Madison and Milwaukee in the 1990's. Schrager is the author of The Principled Politician, a biography of former Colorado Gov. Ralph Carr whose stand on behalf of Japanese Americans after Pearl Harbor would cost him his political career. The book led state lawmakers to name the new state justice center after the former Colorado chief executive. His latest book is The Blueprint: How the Democrats Won Colorado (and Why Republicans Everywhere Should Care), co-authored with Rob Witwer. It has been lauded by the Wall Street Journal, the Washington Post and political figures on both sides of the political spectrum. In his career, Schrager has won numerous journalism accolades, including more than twenty Emmy awards. He taught journalism at the University of Denver and at Marquette University for a number of years and has conducted dozens of seminars on the impact of the media on politics. Schrager has an undergraduate degree in history from the University of Michigan and a graduate degree in broadcast journalism from Northwestern University. He lives in Madison, Wisconsin with his wife and three children.